The HRX is only a 2HR with some more memory (RAM of 64kb) and above all, a new integrated language, the Forth !! Yes, you read well : FORTH. 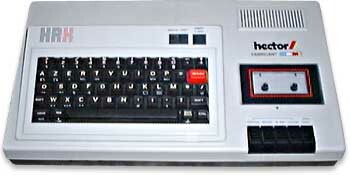 At this time, as the Jupiter Ace was no longer produced, the Hector HRX was simply the only micro-computer in the world with Forth originally integrated (at least I think). END OF PRODUCTION 1985 ? see more Micronique HECTOR HRX Ebay auctions !